Inspired by Dana’s beautiful nature mandalas, I set out to make my own. I have little experience in mandalas except reading about the sand mandalas the Tibetan monks make. They create complex circular designs out of sand and then ritualistically destroyed their creation, ceremonies and prayers lifted up during the end. I set out in the morning with a bag and a husband and we skirted along the hems of native plants growing in profusion along a creek. I always hesitate to pick flowers. It feels cruel tearing the flower asunder from the mother plant and as much as I love bouquets of fresh flowers, I rarely indulge. Today however, I sniffed the breeze and began to pluck tiny purple Michaelmas daisies, dropping them into a pouch as I went along. After dodging assorted bumblebees and harvesting a few flowers, I marveled at how many flowers were left. It’s as if I never touched them, so many still tilted purple under the sun. I prayed a quiet “Thank You” for the bounty of the flowers and sent a few lavender buds into the breeze in an attempt to return what I had taken. We moved onto a sumac bush. 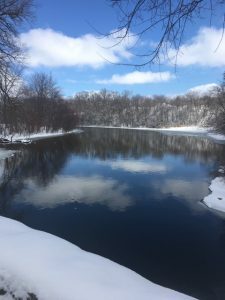 What I did not expect was while I gathered, I felt my heart threading its way through the rising vegetation and then along the water of the cool creek glinting below. For the first time in my life, I did not want to leave my current home. The thought of leaving this small piece of restored land, profuse with flowers, bugs and animals, suddenly wrenched my heart out. I come from a long line of wanderers (as I think most Americans do) and I have always wondered where we would wander next after this home. This time, however, I did not want to wander. My hands were joined to the land as I nimbly picked leaves and flowers and now my heart was as well. Leaves, flowers, and crabapples in hand, we wandered back and I began to build my mandala, spinning out a circle that radiated from three glowing daisies in the center. I built the art knowing that it would come swiftly apart and be sent back into the world. A certain joy caught up with me then- the joy of freedom. It’s a very gentle feeling, very small but it grew as I added leaf after leaf and flowers after flower to the circles. It continued on even as I ripped the mandala apart, sending the bounty back to the outdoors. As I cleaned up the litter and tiny bugs fallen from the petals, I reflected on how the mandala wasn’t to make money, to further my career or anything like that. It was a celebration of play. It was the gathering, the creation of beauty and then the destruction that is so necessary to our lives. The materials I loosened from the plants and trees were now settling into the earth for the next growth cycle. My internal load was lightened as well during this simple ritual. Making a mandala clears the mind and sweetly teaches the lesson of letting go. 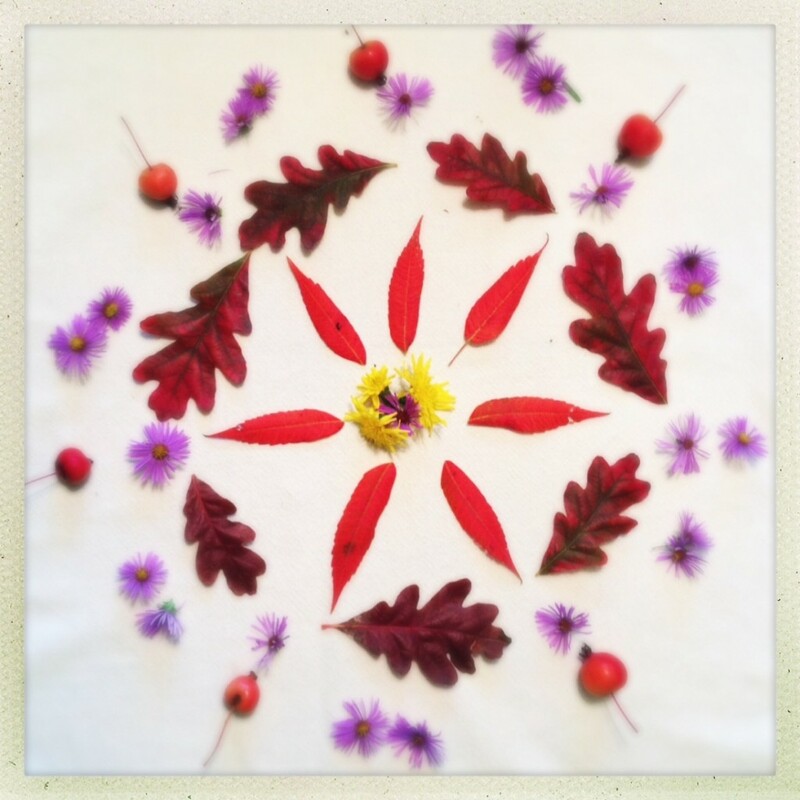 As we head into winter, I look forward to making more mandalas out of what the season offers. Even in the depths of dark cold, there will be a few twigs and berries to lend themselves to creation. Such gorgeousness in your getting native with Earth. Such alchemy in your intimacy with the flowers. A unification bonding with your Sense of Place. Love your delicate writings Catherine. You express a polarity with one who never wants to leave her habitat, so in love am I.
I have been feeling the call to make mandalas as well and reading this post was a good motivator for me to start. Thank you! Your comments are always such a pleasure, dearest Fir Maid. Thank you for them! Dana’s teaching me to see potential mandalas everywhere. One may just need to happen today now that fall is further in her season. I hope you do, Grace! Once you start to notice all the little bits that nature supplies, they get super easy to make. I’m going to try one today but make it outdoors rather than in and see the different energy it creates.